Maintenance Connection, a leading provider of browser-based Enterprise Maintenance Management Solutions, will be exhibiting at the ASHE 48th Annual Conference & Technical Exhibition. The event will be held July 18-20, 2011 and will be located in Seattle, Washington at the Washington State Convention Center. This is a highly attended event for all individuals working in the health care facility management profession, or working with health care facility managers. A large exhibitor area is provided where Maintenance Connection will be on display, and representatives will be available for questions. 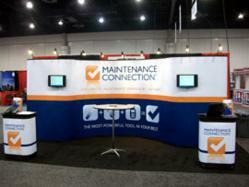 You can find Maintenance Connection at booth #336. The Maintenance Connection application connects maintenance personnel to extend asset lifecycle, track maintenance costs, prevent and predict equipment failures, improve labor productivity, reduce costly equipment downtimes, minimize investments in inventory, and lower the total cost of maintenance. Their unique combination of cutting-edge CMMS/EAM technology and emphasis on service excellence for customers has led to thousands of satisfied users worldwide. Maintenance Connection provides a version of their CMMS that is custom tailored to meet the specific needs of the Healthcare industry. Whether it’s Preventive Maintenance, Corrective Work Orders, Asset Downtime tracking, or Asset work history; Maintenance Connection handles healthcare asset management to the fullest potential. Privacy and accountability in the healthcare industry is a must. A few key factors that offer this in the Maintenance Connection solution are: Multi-level security database, Multi-level user access control, High level reporting capabilities, and complete audit trail tracking. Maintenance Connection also offers a highly customizable risk assessment strategy based on laws and regulations, to help maintain a health organization’s utility and clinical equipment. Maintenance Connection’s combination of superior software and commitment to service excellence sets their health specific CMMS application apart from the competition. Their track record has proven they know what it takes to get Healthcare systems online. Maintenance Connection representatives provide free online demonstrations for anyone interested in learning more about their CMMS applications.